It wasn’t this morning, it’s been occurring morning after morning for a long time. I’ve been waking up wanted . I woke up to the realization of what being wanted translates to for me… It’s being Loved. Big, boldly, with complete abandon , laid down. I don’t know why it took so long to fully wrap my heart around it. Maybe because love is a journey down a long and winding path, instead of a quick walk across the street. I wish I could go back and tell the girl I was at 14 , that it was all going to be ok, that she was loved by a love so ancient and huge , that time was on her side, and that her love story was being written by the author of the world. Only God knows the beginning and the end. I would tell her then what I know now … You are wanted, you are loved. You always have been. Your name was KNOWN as the foundations of the earth were poured . You there, at the post office, at the elementary school, making lunch , walking down the hall in your highschool, and you there still in your bed….you are wanted. It’s God that is in the details. I posted this on my social media earlier today. 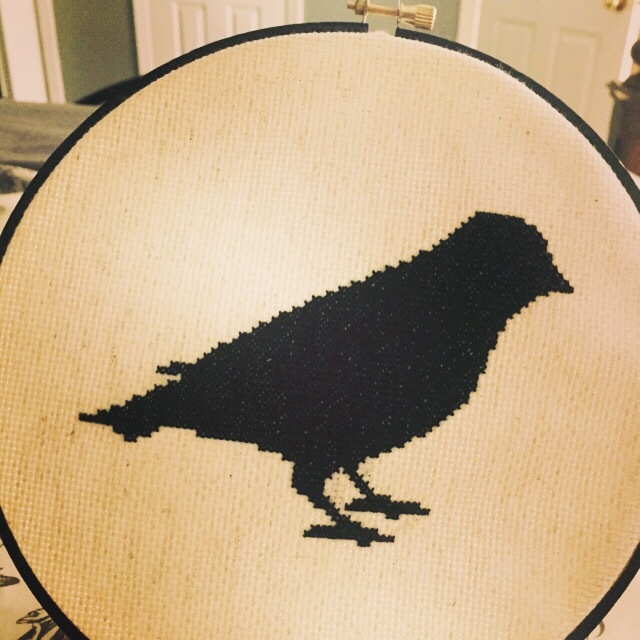 I am amazed at this cross stitched bird. It was a gift from my sister several years ago. Long before the Lord whispered the word bird to me. Long before he spoke to me of feathers and wings, and the beauty of our nests. I looked at this prized possession of mine today, and heard God say “that’s foreshadowing angie”. Why yes , yes it is God. God is in the details. It is his pleasure to conceal things, to set up an extravagant scavenger hunt for me. And my joy and honor to seek these truths and treasures out. So my nest, and where I make it, and what I feather it with…. All of it, are not mysteries to HIM. It’s in the dailies, that I find him. Like a shelter, friendship is a house. It is built on words , they are the foundation. You lay words of love and encouragement like bricks on the bottom. Then you insulate with time, time spent listening and believing in each other’s dreams, hopes, and sorting out the struggles.You can spend years insulating and shoring up the walls for the future winds that blow. And then you paint the walls of your friendship with deeds. Some tiny , like a letter in the mail, and some huge like a birthday extravaganza. You can decorate your friendship with laughter, and tears, memories of births, weddings, school plays and a million dinners. There is always time to add rooms or update this sweet house. But if you neglect your house, there will be weak spots , and dry rot . And what looks strong from the outside could be deceiving .You can get lost in the rubble when it comes crashing down. I encourage you, take a minute, check the foundation of your friendship . Need to lay a few words down? Give some time . Don’t hold things so closely to yourself. Share. And when the storms of life rage , you will find yourself running to that shelter again and again. If you are lucky, there will be more than one shelter to run for when the rain pours, there will be a community ! And a neighborhood party when the sun comes out again! Sometimes everything is upside down. Is it ok to be mad about it? Yes it is! And then get over it. Move on to something good, look on the bright side. I’m on the inside of the upside down right now. Health, relationships, and responsibilities are all costing me more than they should. My emotional budget is in the red. Maybe you feel that way too? It’s ok , for a while ,to wrestle around in the muck in your upside down world. But there is a limit. You have to come to a cross roads , hang on or let go. Then shower, and live life. I’m getting ready to come out right side up. I’m dancing to Disney’s Let it go, and remembering who I am . I’m getting real with myself, asking myself the tough questions, and being brave enough to answer them.